UH and Robin noticed Nutmeg squinting one of her eyes a few days ago. Then she started pawing at her eye. THEN the humans saw discharge coming from the eye that was inflamed all around. Then the human called our kind, wonderful veterinarian. Nutmeggy went in yesterday morning, just as the north wind really got to blowing around here. She and Robin drove through mist, but at least the air was still warm enough to keep the mist from freezing on the windshield or the road. Nutmeg sang all the way to the vet, just like I do. She learned all the best stuff from me. The vet took one look at my little, round sisfur and said, “You’ve got a good case of conjunctivitis going.” Meanwhile, Nutmeg had stopped singing and had befriended the vet tech who weighed her, took her temperature and drew some of her blood. The first thing Robin asked the doctor was if Nutmeggy needed to be isolated from the rest of us kitties. The vet said no, that conjunctivitis is contagious, but not that contagious. 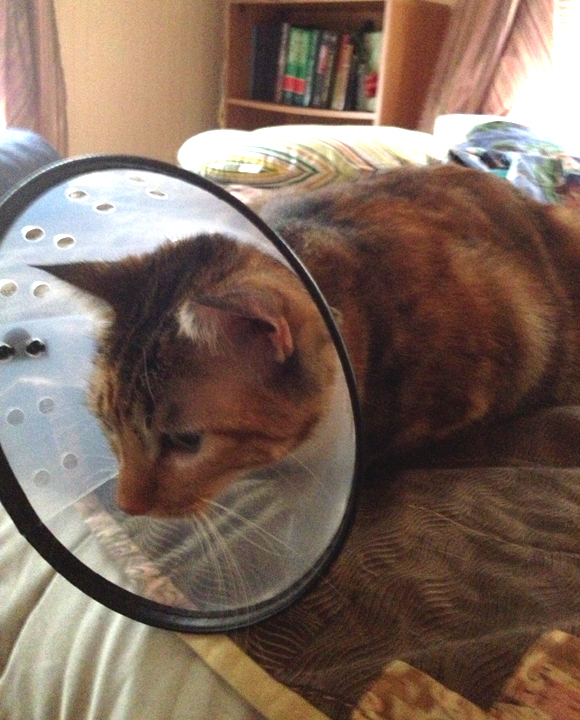 The next thing the vet said was that Nutmeg needed to be fitted for an e-collar. By the way, the vet also tested Nutmeggy’s blood to make sure her liver and kidneys are working ok and her blood sugar isn’t out of whack. She had only gained .2 of a pound, but the humans worry that her roundness has an impact on her health. Our vet said Nutmeggy’s blood is perfect! 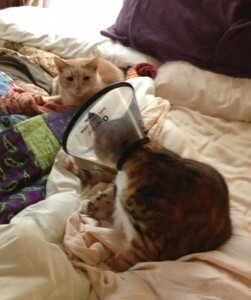 Nutmeg doesn’t much like her cone (Robin calls it the Cone of Care, rather than that name other people call it). When she first put it on, Nutmeg bumped into everything she walked by. She was trying to rub her face on all the corners and stuff, to say she’d been there and was friendly, but the cone is wider than Nutmeg’s face. Her face is round, but the cone is rounder. Nutmeg walked around EVERYWHERE, trying to get away from the cone, I think. She has an unusual gait with the cone on, too. Then the AT&T man came. Everyone was upset. We all needed to hide from the AT&T man. Robin let Nutmeg take the cone off until after he left. Nutmeg needs medicine in her eye 3-4 times a day for a bit longer than a week. She has ointment that she would rather eat than have squirted in her eye. Robin tries to get the medicine in the right place for Meggy to blink into her eye, like the vet showed her. We’re not sure how much medicine actually makes it in the eye – the left one – but Robin gets a lot on little Meggy’s face, that’s for sure. Meggy has 48 hours to start improving, or she has to go back to the vet for different medicine. Robin thinks Meggy’s eye is showing improvement. Not back to perfect yet, but less swelling, no pinkness around the eye and less discharge. We checked what the Cornell University feline veterinarians have to say about conjunctivitis in cats. The conjunctiva is a thin mucous membrane between the inside of the kitty eyelid and the kitty eyeball. Conjunctivitis is an inflammation of the conjunctiva. 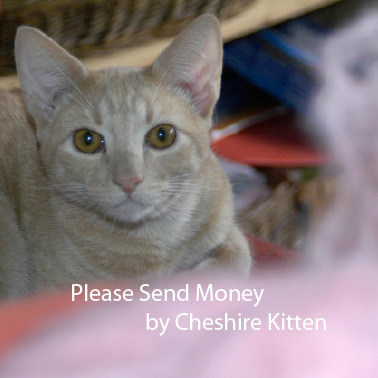 It’s the most common eye ailment in cats and almost all of us will get it at some time in our lives. Inflammation of the conjunctiva can be caused by bacteria, viruses and stuff in the environment (like dust or some plants), so it’s difficult to tell how contagious any single instance is. Since our vet said Robin didn’t need to keep Meggy away from the rest of us, we assume no one else is likely to get the infection. The vets at Cornell Feline Health also say that humans and cats can share conjunctivitis, but again, whether Nutmeggy could spread her particular conjunctivitis with a human would depend on the cause. Robin is washing her hands before and after medicating Meggy’s eye, as she should. The vet said Nutmeg has a mild case that she was making worse by rubbing her eye. That’s why she has the e-collar, to keep her from rubbing her eye. 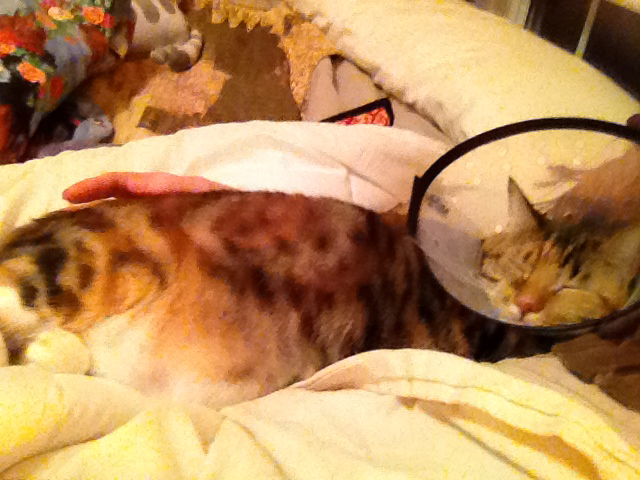 She probably won’t need the cone after today because she’s broken the pattern of rubbing. I hope she can take it off because it makes her unhappy. Two things are comforting Nutmeggy: sleeping with her “mom” and the new heater that Robin bought for her bedroom. That bedroom went from being the coldest room in the house with temperatures in the FIFTIES Fahrenheit to a nice high sixties. Nutmeg and I both spent a lot of today sleeping on pillows on the side of the bed nearest the heater. Christmas Cards You Can Buy! Sending prayers to Meggy. Hope she will feel better soon. 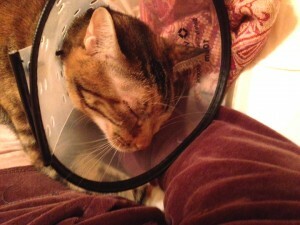 Get well soon Meggy, tortie/torbie purr powers unite! It sounds like Robin and I have the same issues when using eye ointment on kitties. I always hoped I got enough in Evelyn’s eye to do the job! Hope Meggy recovers quickly. Those cones serve a purpose however…….. Thanks! I think Meggy’s feeling better already. She’s been sleeping next to Robin for a couple of hours now. I’m sleeping on a pillow on the bed, too. I’ll tell her about heated mattress pads. That sounds like a great idea, and we have a Costco not far from here! My Mom has one on my, I mean our bed too. They are pawesome- not overly hot and cooking as an electric blanket. 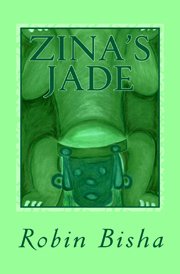 There’s just the right amount that can be adjusted and heats up mewz entire body. Four paws up is my vote!